Tansy has a long history of use, but it is quite toxic. It was first recorded as being cultivated by the ancientGreeks for medicinal purposes. In the 8th century AD it was grown in the herb gardens ofCharlemagne and by Benedictine monks of the monastery of Saint Gall. Tansy was used to treat intestinal worms, rheumatism, digestive problems, fevers, sores, and to “bring out” measles. 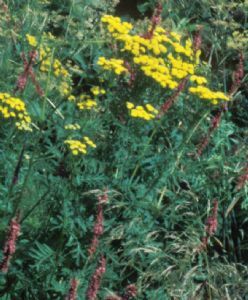 During the Middle Ages and later, high doses were used to induce abortions.Contradictorily, tansy was also used to help women conceive and to prevent miscarriages. In the 15th century, Christians began serving tansy with Lentenmeals ('Tansy pudding') to commemorate the bitter herbs eaten by the Israelites.Tansy was thought to have the added Lenten benefits of controlling flatulence brought on by days of eating fish and pulses and of preventing the intestinal worms believed to be caused by eating fish during Lent.